Under the theme “The EVFTA: Building on 30 years of FDI - 20 years of EuroCham - 10 years of Whitebook”, the European Chamber of Commerce in Vietnam (EuroCham) in coordination with the Vietnam Chamber of Commerce and Industry (VCCI) launched the annual Whitebook and the EU-Vietnam Free Trade Agreement Outlook 2018. Mr Bruno Angelet, Head of the Delegation of the European Union to Vietnam, said that, based on macroeconomic indicators, Vietnam has experienced an optimistic year. With a GDP growth rate of 6.8 per cent, Vietnam is among the most active economies in the region. Furthermore, it successfully attracted nearly US$30 billion of foreign direct investment (FDI) in 2017, an increase of 44.2 per cent compared to the previous year. These conditions will further make Vietnam an attractive destination for investors. EuroCham acknowledged the efforts of the Government of Vietnam in gaining access to and upholding the essential role of FDI enterprises, while enhancing competitiveness and improving the business environment in Vietnam. Despite highlighting positive changes, the Whitepaper still points out areas that Vietnam needs to further improve, significantly including trade barriers, access to capital, lack of skills, corruption, inadequate infrastructure, high tax, high inflation, foreign currency policy, and weak labour regulations, which are considered substantial challenges to FDI enterprises at present. According to the Whitepaper 2018, the EU is Vietnam's second largest foreign market and a destination for 18 per cent of Vietnam’s exports. With a bilateral trade value reaching US$50.3 billion in 2017, the EU is Vietnam's third largest trading partner. 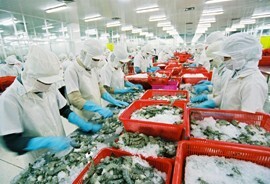 Vietnam currently has a trade surplus of US$31.8 billion with the EU. European investors invested a total of US$915.5 million in 151 projects in Vietnam in the year and they are actively promoting investment in this potential country. Nevertheless, in addition to opening opportunities at the back of EVFTA ratification, Mr Bruno Angelet said that this time requires much effort from both sides to make good preparations for Vietnam - EU bilateral relationship in EVFTA. Deputy Prime Minister Vuong Dinh Hue said that more EU businesses are arriving in Vietnam. This shows that Vietnam has opening and accommodating policies helping to facilitate foreign investors, including Europeans, to do business in the country. He added that, in the past 10 years, the Government of Vietnam has always been very open-minded, welcoming recommendations raised by the Whitepaper, some of which have been addressed by Vietnam, some need more time for further discussion, and some are added to commitments in the framework of the Vietnam - EU Free Trade Agreement (EVFTA). Once this pact is approved, these issues will be resolved. Mr Gellert Horvath, President of EuroCham, said, EVFTA would promote bilateral trade and investment, driven by tax reduction roadmap and strong commitments from both sides. In addition, this deal not only provides incentives for Vietnamese industries to have development opportunities, but also improves the investment environment and promotes the quality of Vietnam's exports to EU nations. EU pledges to strongly support Vietnam in the process of modernisation and integration into the world economy. The Whitepaper 2018 also has very positive remarks when EVFTA is adopted and enforced. This will create tremendous momentum for both Vietnam and the European Union. Accordingly, EVFTA will promote Vietnam's growth and development across all sectors and fields, and it will improve the legal framework and business environment, reduce tariffs and boost exports to the EU. This not only benefits the business but also positively impacts welfare, wages and living standards. The Whitepaper 2018 also provides recommendations for Vietnam, ranging from raising statutory representations to one-member limited liability companies or the development or building sustainable energy roadmap to draw new investments to enforcing intellectual property rights.